tyGraph allows you to easily gain deeper insights into your Yammer data. 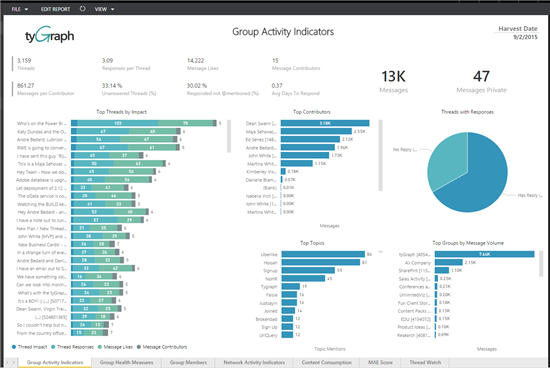 Power BI allows you to analyze and monitor that data, by offering out-of-box content built from your tyGraph data. This content pack includes a dashboard, a set of reports and a curated dataset to explore and provide insights such as the Measure of Active Engagement (The MAE Score) and content consumption metrics such as File Views and File Downloads. 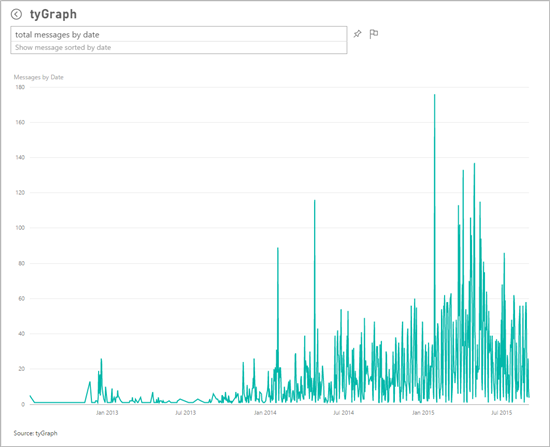 This post will detail how the Power BI content pack helps you explore your tyGraph data. For additional details on how to get started, please see the tyGraph content pack for Power BI help page. A dashboard is automatically created once you’ve provided credentials. The dashboard is a set of tiles, each one displaying a specific metric to monitor from the dashboard view. Select one of the tiles to drill in further to the reports, such as “Messages”. This brings you to the Group Activity Indicators report, one of seven pages of reports that are included as part of the out-of-box content. Other reports include Group Health, Group Members, Network Activity Indicators, Content Consumption, MAE score and Thread Watch. Each tile on the dashboard may lead to different report pages. The reports include a set of visuals with different insights. You can hover over any of the items for more details, or select a particular value to cross filter the other visuals on the page. The filter pane allows you to change the slice of data you’re viewing. Any of the existing visuals can be pinned to the dashboard, allowing you to fully customize it for your needs. In the report you can also switch into Edit mode, to view all the fields available for your reporting. This allows you to edit or add additional visuals to customize your report and dashboard. Another way to explore the data is through the question box above the dashboard. Start by asking a question of your data – such as “Total messages by date”. Those results can also be pinned to your dashboard by hovering over the image and selecting the pin icon. After the initial import, the dashboard and the reports continue to update daily. You can control the refresh schedule on the dataset. 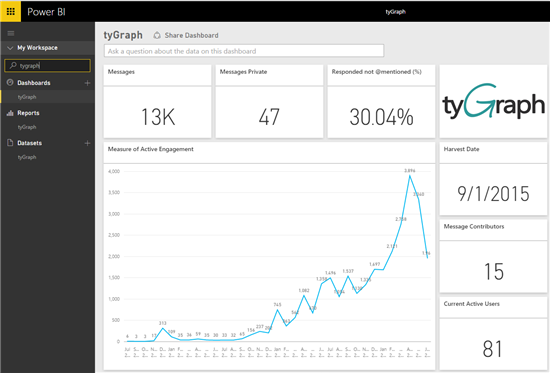 With the tyGraph content pack for Power BI, you have an initial set of metrics and actionable insights. These insights help you gain a better understanding of your organization and will help inform your social strategy decisions.